Well, this cow is clearly more rock 'n' roll than any of us. Appropriately named “Genie,” the world has noticed her striking resemblance to the Gene Simmons of Kiss, and we think it’s seriously amazing. 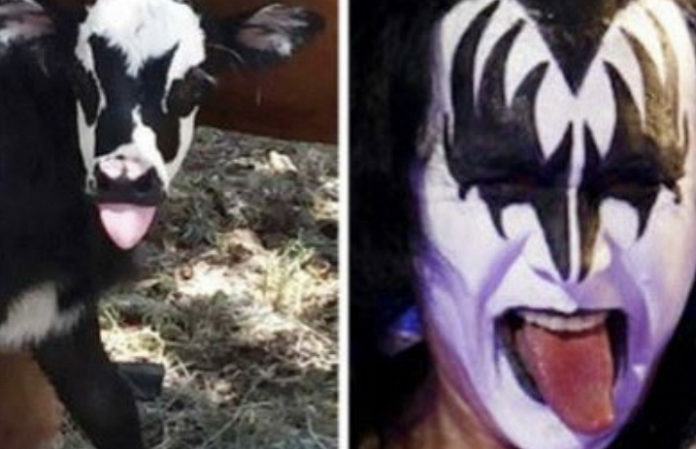 According to the BBC, the calf was born on Friday at a ranch in Kerrville, Texas, and he even likes to stick out its tongue, just like Gene Simmons himself. Of course, the Texas city is playing up the calf’s Kiss connection, claiming that Kiss music was playing on the ranch on the day of Genie's conception. Whether or not that is actually true or not, there’s no denying that this cow holds some serious resemblance. Gene Simmons himself agrees! What are your thoughts on the Kiss cow? Let us know in the comments below!